It’s clear when we talk to our customers, they need an agile approach to hybrid cloud technologies. While the cloud consumption models increase in complexity, US Signal continues to evolve. This is another step in the right direction. Midwest cloud-hosting provider, US Signal, announced it will enhance its current cloud offering by delivering a complete hybrid solution using the Cisco Intercloud Fabric. Participating as a Cisco Intercloud Provider will give its customers the ability to extend their on-premises workloads into the US Signal Cloud while maintaining control over their entire environment both physically and virtually. As cloud consumption explodes, customers need a hybrid environment that maintains consistent security controls across all cloud deployments. Peder Ulander, Vice President, Cisco Cloud and Managed Services Organization. 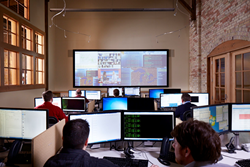 With eight physical data centers and over 14,000-miles of fiber, US Signal’s Cloud and Managed Services Organization easily combine and place workloads, including their network and security policies, with Cisco PowerMidwest and includes both HIPAA and PCI Compliant Cloud and Network-based solutions. New and existing customers rely on US Signal for data backup, disaster recovery, managed and professional services. For more information about US Signal please visit: https://ussignal.com. With over 14,000 miles of lit fiber and metro rings in 23 strategic tier-one, tier-two, and tier-three markets, US Signal’s infrastructure is one of the largest, fully deployed networks in the Midwest. The network’s optical backbone features Cisco Systems latest carrier class architecture and supports all of US Signal’s products. US Signal’s product portfolio includes a full suite of colocation, disaster recovery, security and cloud hosting services to complement its network offerings. Delivery of these services over their protected network ensures US Signal customers unparalleled flexibility, resiliency, and scalability to meet their business needs.